Photo courtesy of Langdon Flynn. Ciao Bella. Carnival is annually marked by an over-the-top celebration with elaborate costumes and masquerades, glittering decorations and a whole lot of inebriated revelry through the streets. Wait a minute – that sounds a lot like Vegas. The Palazzo Waterfall Atrium has provided us with the festive atmosphere all summer long while we brought the drunken part-tay. Just kidding, we most definitely behaved ourselves. This is a classy joint. 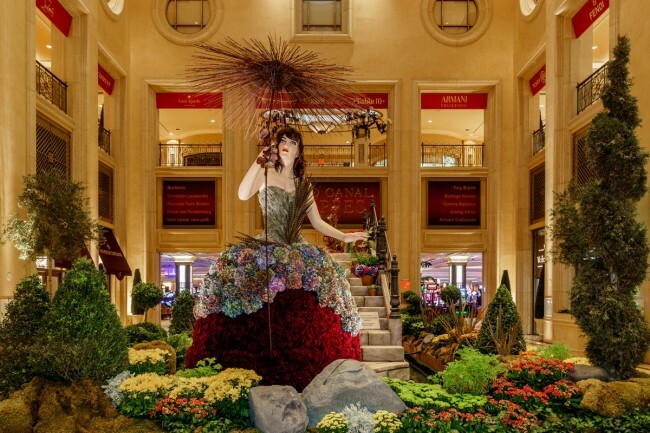 August marks the grand finale of the atrium’s three-part summer floral installation and they did not disappoint. Each of the nine-foot topiary women is dressed in rich, deep hues for the fall season. Between 3,000 to 4,000 flowers, oak and maple leaves, willow and different mosses make up their traditional Carnivale di Venezia costumes. The flowers were shipped to Las Vegas from Holland, Ecuador and California just for the occasion. 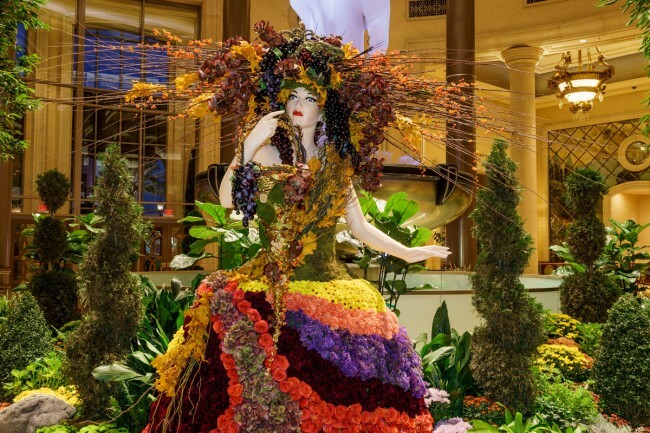 Each floral gown takes eight hours of gardening and structural maintenance every week. But if you think that’s impressive, wait until you hear this: By the end of August, the three-month extravaganza will have used 200,000 flowers and the horticultural team will have spent 400 man-hours to maintain the displays. After two years of state-of-the-art engineering and design, it took a team of 20 floral designers, gardeners and engineers 1,200 hours to set up the installation. 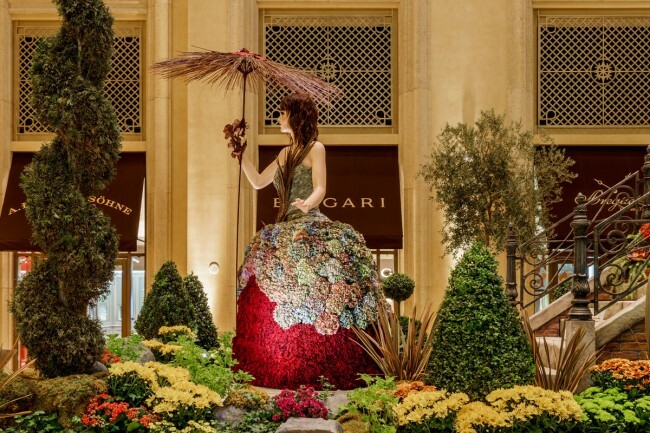 Each Venetian woman has been “re-dressed” in a gown hand-made from thousands of different flowers each month to completely change their looks. It’s been three months and we still can’t decide which bella donna is our favorite. We’ll definitely be sad to see this one go. 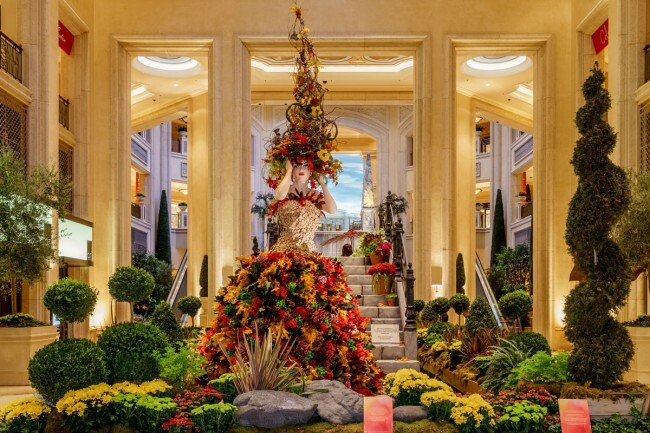 The new autumn display at the Palazzo will be started September 7 and should be complete by September 11. It will feature more burnt earthy colors of the season with 15-foot cattails, floral pumpkins and birch trees.